At Integrity Auto Finance, we require that all of our customers maintain full-coverage insurance throughout the life of their car loan. This helps protect your investment, as well as your credit (while your on-time payments are helping to improve your credit). Check out the video below to learn more about why this is important and what can happen without insurance. 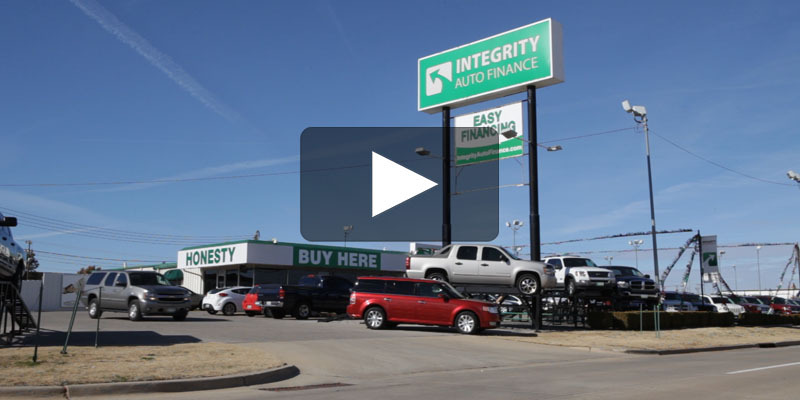 Karla Banks (Business Development Specialist): Here at Integrity Auto Finance, we know that you want to protect your investment and your credit. The easiest way to do that is to maintain full-coverage insurance throughout the life of your loan. Most lenders are more likely to approve you for a new loan if you have full-coverage insurance at the time of an accident. If you have an auto loan and the vehicle is wrecked without insurance, you are still responsible for paying the remaining balance. Don’t take the chance of being garnished for a vehicle that you can’t drive. Narrator: One customer let his full-coverage insurance lapse by just one day, then the next day his wife totaled the truck on her way to church. Letting the insurance lapse to save $100 ended up costing the customer over $20,000 dollars, while also ruining the good credit he was building. A repeat customer, thinking he was a safe and careful driver, thought he could get away without paying for full-coverage insurance. Unfortunately, he was hit by an uninsured motorist, and his truck was totaled. He still owes around $15,000 on a vehicle he can’t drive. And he’s no longer eligible to be an Integrity customer. A new customer bought the Mustang of his dreams, let his insurance lapse, and then, soon after, he totaled his dream car. He lost his car, but is still responsible for the majority of his loan. He is now facing collections. Karla Banks (Business Development Specialist): Here at Integrity, we have resources to help you maintain full-coverage insurance. Ask your sales associate today how you can protect your investment. Narrator: Auto insurance will only pay a maximum amount that’s equal to the value of the vehicle. So what happens if you still owe more on the loan after that? If the vehicle’s totaled early in the loan, you’ll be responsible for the amount of money that the insurance doesn’t cover. That’s where the Gap Insurance comes in! Integrity offers additional Gap Insurance through our financing company. If you have a valid, up-to-date auto insurance policy and you also purchase Gap Insurance through us, then the Gap Insurance will step in to help cover the difference. Dontay Pompey (Sales Manager): Not only are you required to have full-coverage insurance, but state law says you have 30 days to register and tag your vehicle. Karla Banks (Business Development Specialist): If you fail to get your vehicle tagged within 30 days, you run the risk of getting pulled over, facing fines, and even having your vehicle impounded.